You and your guests will have a ball competing in a skee ball match. 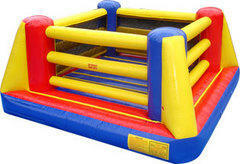 Put on the oversized boxing gloves and go a few rounds in this bouncy boxing ring. Comes with 4 beach ball sized boxing gloves. Strap into a harness and run as far and fast as you can. Try to stick your velcro place marker to the center wall before the super strength bungee cord springs you back. 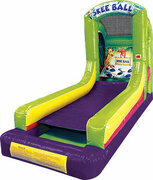 Slip on the sticky suit, take a leap and get stuck to the 13 foot velcro wall.